This quality cowhide leather was double hand-fringed with your choice of a silver tone split keyring or swivel hook with a matching rivet. I added glass crow beads in fun contrasting colors then added silver metal beads for extra detail and flair. 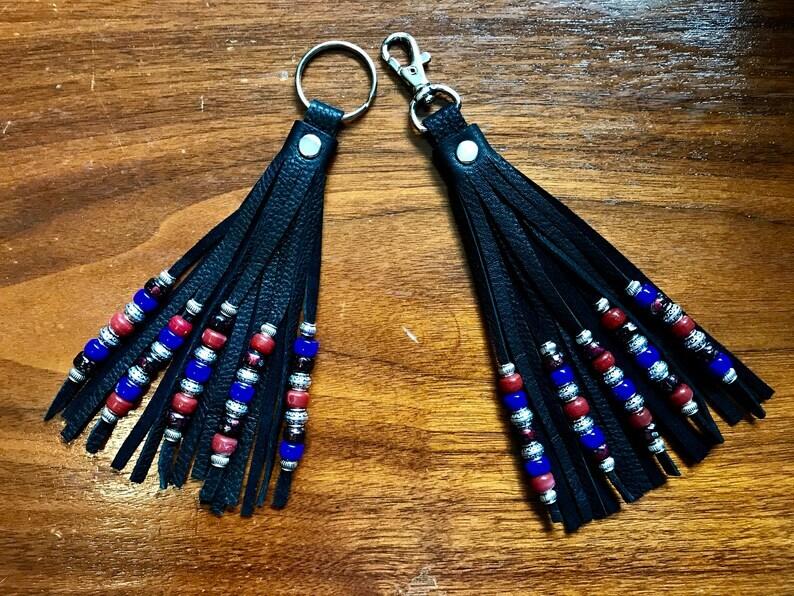 The leather fringe is 6 1/4 inches long - total length is 7 1/4 inches with the keyring or 7 3/4 inches with the swivel hook. Add some pizzazz to your existing keychain, purse, backpack, luggage or other bags. Make it easy to find your keys in your purse. Note: Silver beads may vary from those pictured.